Join us for a Southern Ocean adventure like no other! On this all-inclusive 22-day journey, we’ll experience the best that the region has to offer, including the subantarctic Falkland Islands, South Georgia, and the Antarctic peninsula. This trip has it all! We’ll encounter diverse and abundant wildlife, be awed by expansive landscapes, and visit historic sites that evoke the days of early exploration. We’ve timed our expedition for the end of the Antarctic spring and the very beginning of summer, one of the best times for photography in the region. In the subantarctic islands, this is courtship time for seabirds; vast numbers of them are gathering. 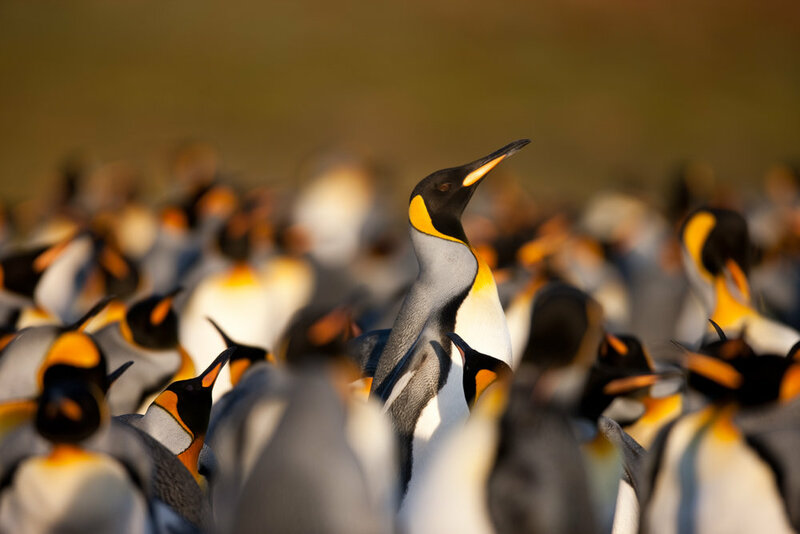 King, macaroni, gentoo, and chinstrap penguins are mating and beginning to tend eggs, and the previous year’s king penguin chicks are shedding their down. Wandering albatross chicks—nearly grown by now—are beginning to test their wings. Elephant seals are consolidating their harems as females arrive en masse to the beaches, and a few fur seals may also be spotted. On the peninsula, snowfall is still likely during late spring, adding drama to icy landscapes and wildlife tableaus, and the whales are starting to arrive at their summer feeding grounds in the region’s nutrient-rich waters. Expect rapidly changing spring weather, but also dramatic skies and unparalleled light conditions. Fewer visitors this time of year means greater opportunity to explore. Muench Workshops is the sole charterer during this time period, so we “own” the boat. We control the itinerary. We’ll be able to make adjustments to our course for ice conditions, light, and extraordinary wildlife and landscapes. This allows us to maximize photographic opportunities with as many shore landings and zodiac excursions as possible. Our ship is small, and can access all potential landing sites—we’ll go where the big ships can’t, and make more landings. And with only 60–70 guests alongside 10 pros and 8 naturalists, our instructor ratio is unmatched. Expect one-on-one instruction in the field, and our signature image reviews in the evenings and during sea days. We’ll have plenty of talks too, on the region’s natural history, and on photography topics—wildlife photography, beginning and advanced Lightroom, photographic composition, technical refreshers, and much more. We are dedicated to helping you capture the natural beauty of Antarctica! Don’t worry, though, your non-photographer spouse, partner, or traveling companion is also welcome, and we’re happy to help them make the most of the adventure too. As always, everything’s all-inclusive, and this time we’re even including a generous airfare allowance and paying for comprehensive travel insurance!. We have three types of single cabins, four different types of twin-cabins, and some two-room suites available, with tuition dependent on your choice of accommodation. Click for details on the ship, pricing, accommodation, and more.